The most affordable of the yachts that do the complete itinerary loop of the islands (including islands Isabela and Fernandina) - for this reason it comes highly recommended! Comfortable cabins and good facilities - if you have a little extra cash to splash out then the Samba is a great choice!!! 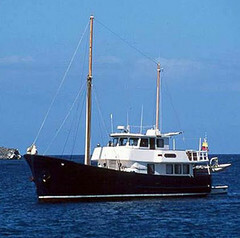 Number of cabins: 7 twin cabins with double lower beds and single upper, 1 smaller single cabin. OLA contact us to book a Galapagos tour.